I‘ve played on three new courses this year and I haven’t enjoyed them that much. In what appears to be a disturbing trend, golf course designers seem to be building the hardest and most unfair golf course possible. Not sure where traditional golf course design has gone but it seems that super deep bunkers in the middle of the fairway, severely tiered greens and putting surfaces running at 13 on the Stimpmeter appear standard practice. Oh, and I nearly forgot to mention deep and nasty rough lining each fairway. Although it can be entertaining for five minutes, I have found these super difficult courses boring and uninteresting to play. I can’t help but think what problems handicap golfers have to go through. A round of golf becomes a serious mission – maybe even four hours of torture. Each golf course should create a Unique Playing Proposition (UPP). The course designer or staff should come up with a short paragraph that uniquely identifies the golf course from its competition. Here’s an example. Course X has been designed to be extremely difficult. It has deep rough, fast greens and is exceptionally long. Don’t even think about playing here if you’re not playing on single figures. The UPP could be placed on the back of scorecards or on a sign next to the first tee and would offer three distinct advantages. It would pre warn you about what you’re about to experience. There wouldn’t be any unwanted surprises and just maybe help you understand why a certain hole is 420 metres, uphill, with an upside down saucer green and plays into the prevailing wind. It would give the course owners a marketing edge. The UPP would help them identify their target market – it would then be a matter of selling the golf course to those golfers who fall into the target market. 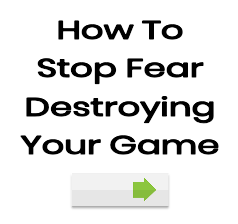 It’s much easier to sell to a unique group rather than everyone. And maybe golf course architects would build better golf courses. They would have to think about the UPP prior to starting and then build accordingly. At the very least it might help us understand what they were thinking. 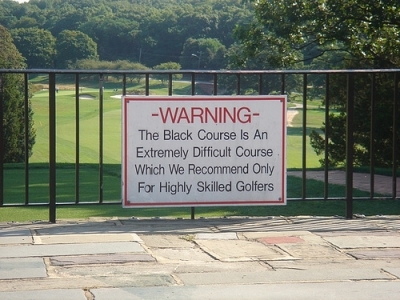 Bethpage Black, host to this year’s US Open, already do this. The message below leaves the golfer under no doubt about what the golf course is about. Last week while on holidays I played at Moonah Links. Although I found it incredibly tough, long and almost an unfair golf course, I knew before I teed off that that was to be expected. Designed for the Australian Open, Golf Australia wanted a course that was tough – and it has been marketed that way. Sometimes marketing can go a long way. I think golf course design has tried to get their own back due to technology. Jack Nickluas said todays golf ball goes way to far. He feels some great golf courses in the states have become obsolete due to the fact that players are using drivers and pitching wedges where he use to use driver six iron.So golf architecture has tried to combat the distance average players get with sneaky bunkering, long rough, triple tiered greens that are very fast and narrow fairways. It’s easy to combat the golf ball change, just change the par for the course, if it is 72 make it 70 with 2 par 5’s instead of 4 par 5’s. You could bring in a local rule regarding par 5’s and that is players are only allowed to use a 3 wood off the deck no tee. That would sort the men from the boys. Impress your friends with tales of losing 10 balls and 4 putting five times ! Now that’s a course you have to play. The features are obviously designed to get people talking, so the marketing people have done their job? Fair enough to warn people, but targeting a unique group might not do much for the courses income. I think any course should be set up to allow different standards of golfer to enjoy. We all know that the golf ball is the culprit. When will someone with authority change the balls to limit the distance, i.e. someone with the balls to do it, and not be intimidated by the legal threats from the ball manufacturers. I believe there is a movement to have shorter games of golf which I suspect is partly a result of extra long tough courses taking forever to play. Many years ago Gary Player commented that American courses are quite wide open with little rough so that the large number of players can get round faster. Clearly an appropriate design is to have rough where finding the ball is easy but playing it is difficult (to varying degrees). E.G. trees, bushes etc. with with good ground clearance of the foliage but with plenty of foliage to interfere with the swing – much more preferable than having thick undergrowth which takes up lots of time to search. Places like the Pines in QLD. with multiple close pine trunks making exit from the rough tricky and exciting. Also The Colonial (Paradise Springs) in QLD where the ball goes into water on ~16 holes-no looking! (there is so much water that a gondolier is better than a cart!). Agreeing with you as usual. @ Gregor: The courses I’m talking about would not suit many golfers. They are close to impossible – if a scratch golfer can’t play them what chance does a 15 handicap golfer have? My main point was trying to understand the designers thinking behind certain design features. If the sole purpose was to build an incredibly tough course then I think they’ll lose people in the long run – yeah, you’ll probably play it once, but I doubt many will return a second time. Thanks for your comments. @ DP: I think you’re referring to traditional golf course design. The golf course doesn’t have to be super long for it to be tough. I played at Port Fairy earlier this year and it’s a classic! Fairly short, but with some wind and small greens a great test of golf. I’m going back later this year for another bash – can’t wait.